Battlefield V’s reveal event is well underway, and EA have confirmed that the game will not feature a Premium Pass – meaning no expansions or map packs to buy. All the content to be added will be available for free to all players, and EA apparently have no plans to re-implement their most unpopular alternative, either. 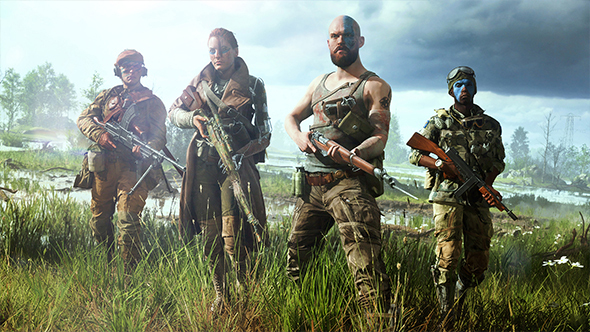 Future content will follow a similar format to Star Wars Battlefront II, with seasonal content and in-game events paving the way for further additions, through what they’re calling the Tides of War service. Each of these updates will be built around a unique chapter of World War II, covering different points of the conflict, each spread out over several months. The first content update will begin in November and run through early 2019, covering the fall of Europe through new gameplay events and content editions. Get entrenched in the best FPS games on PC. EA hasn’t been specific about what sort of monetisation structure will replace the Premium Pass, though the game will have cosmetic items of some sort. On stream the team was quite specific that your gameplay options will be unlocked by playing the game, with no “pay-to-win” systems in place. Though we don’t know exactly what form the new monetisation will take, we do know one thing – there will be no loot boxes. Based on correspondence with an EA representative,Kotakureports that “the game will not have any form of randomized loot boxes.” They’ll of course want to avoid any repeat of what happened withBattlefront II’s random microtransaction debacle. We’ll find out more heading up to Battlefield V’s launch on October 19. We expect to see a more fully featured reveal at EA Play ahead of E3 this year, and we’ll have some hands-on impressions from the event for you soon.